Warm potato salads always remind me of Germany. I like that this one has green beans and tomatoes to go with its creamy sauce. Put the potatoes into a large pot and cover with cold water. Bring to a boil and lower the heat to a simmer. Allow to cook until the potatoes are tender, about 10 minutes. Drain the potatoes and allow to cool to room temperature. Bring a medium saucepan of water to a boil. Add the beans and cook one minute. Drain and rinse with cold water to stop the beans from cooking. 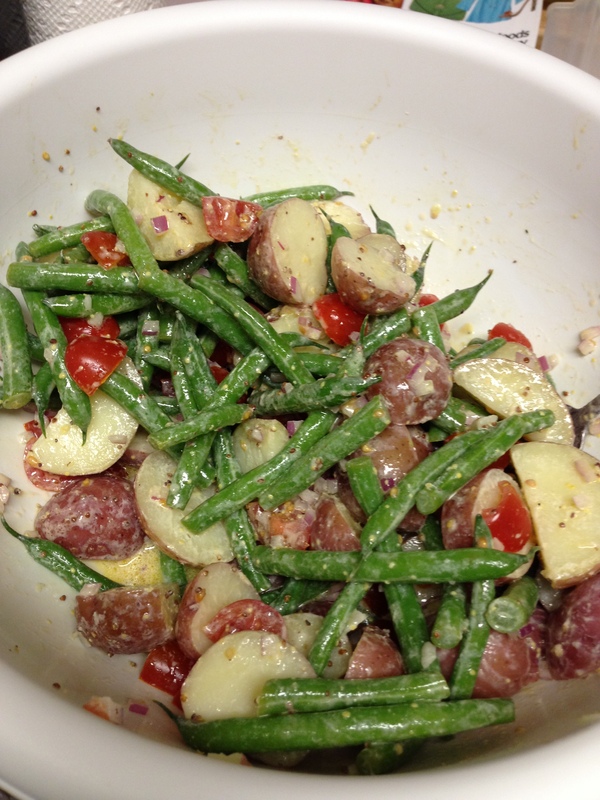 In a large serving bowl, toss the potatoes with the beans, tomatoes and onion. In a small bowl, combine the olive oil, yogurt, vinegar, wine, salt and pepper. Whisk with a fork until well mixed. Toss the salad with the dressing and allow to sit for at least twenty minutes, stirring occasionally. This will allow the potatoes to soak up some of the dressing before serving.